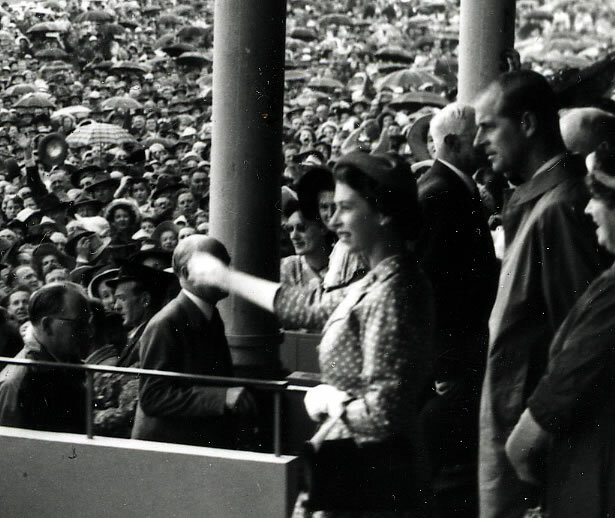 For those New Zealanders old enough to have experienced it, the visit of the young Queen and her dashing husband, Prince Philip, to New Zealand in the summer of 1953-54 is a never-to-be forgotten event. Those who were children at the time recall the Big Day, marked for months in the calendar, when they dressed in their posh clothes, pinned a royal tour medallion to their chests, collected a butter box to stand on, a Union Jack to wave, and perhaps a periscope to look through, and set out to see the Queen. Perhaps three in every four New Zealanders did see her, as the Queen visited 46 towns or cities and attended 110 separate functions. One woman saw her 30 times. Crowds turned up hours before she was due and wait patiently for the split second when she drove past. At Tīrau, a community of 600 people, there was a crowd of 10,000. At the Ellerslie and Trentham races, crowds turned their backs on the horses to gawk at the royal box. People went to extraordinary lengths to show their devotion. Sheep were dyed red, white and blue; in New Plymouth both bowling club members and the local pony club formed themselves into the shape of an E. Screens were erected to hide unsightly buildings, and citizens were instructed when and how to plant blue lobelias, red salvias and white begonias. Hardly a car did not sport a Union Jack, hardly a building in the main cities was not covered in bunting and flowers during the day and electric lights at night. This was a remarkable event. We have 3 events in history, 6 articles, related to Royal Visit of 1953-54.